Our family tries to get s summer job working at a private campground, KOA or state park every year. 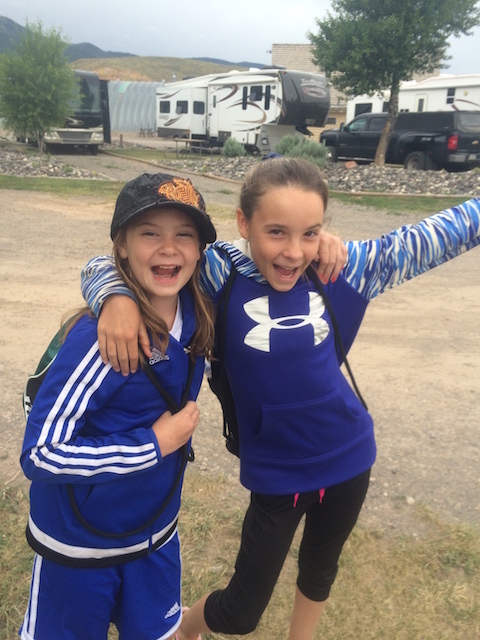 Being in one place for two to four months allows us to enjoy some of the summer camps from local boys and girls club, school, and the local community center. We asked locals around town, the librarian, and the director at the boys and girls club, Jeda, to help us find fun activities for the kids. Some of these activities the girls actually got paid, which made it even more fun. At the Boys and Girls Club the girls have enjoyed working at the local Rodeo as part of the Entrepreneur program. 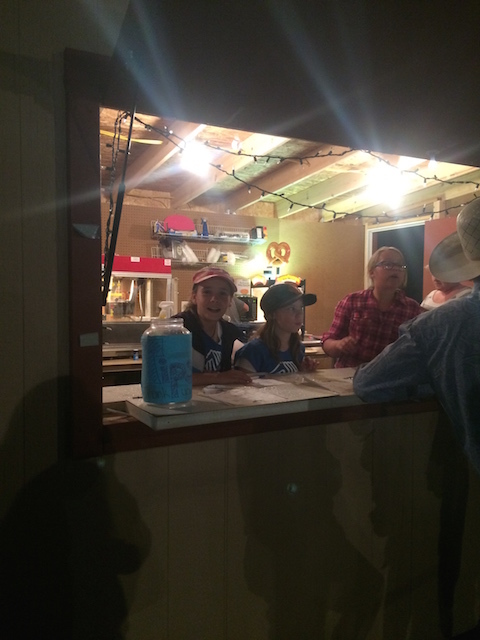 They were able to work in the Snack Shack every Friday night and made $2 per hour for all of their great customer service. 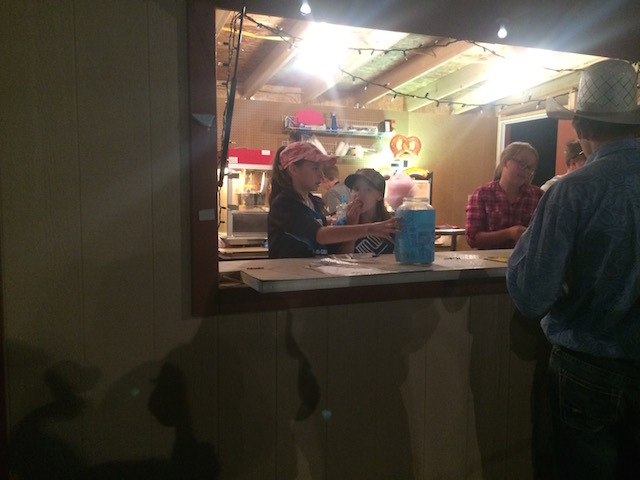 The girls learned how to take orders, fetch food or drinks, make popcorn and cotton candy, and how work a cash register. They were able to come every afternoon and got to know some of the local kids, do some community service around town and earned enough points to go on a 3 day over night camping trip, and to an amusement park. White Water Rafting was a lot more fun than the girls expected. They actually got to go down a 3 water falls, ride the bull (sit on the front of the boat over one of the rapids) and jump in the freezing cold river. The girls thought they were going to freeze to death because for a Georgia Peach the water is really cold here. They did get pretty cold but made lots of friends and had a blast. 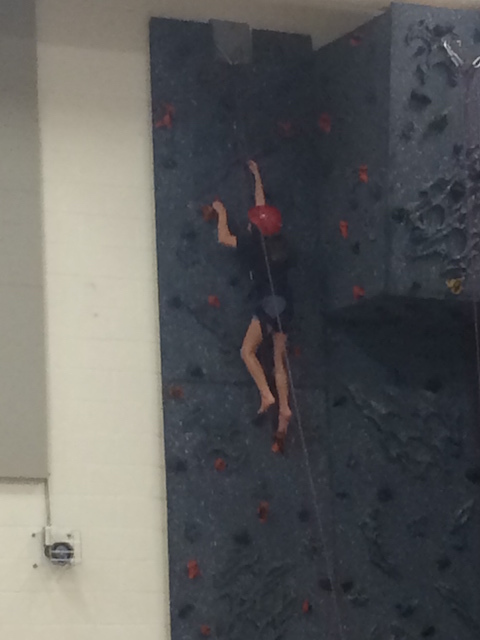 At Rock Climbing the girls took to it like pros and loved every minute. We actually headed to the library first to do Khan Academy and do our college credit course, Learn to Mod before class. They kids learned proper commands for rock climbing, how climb up an incline, how to swing down the fun way (bunny hop). I was very impressed with all the kids for trying every one of the different holds and making it to the top without getting scared. 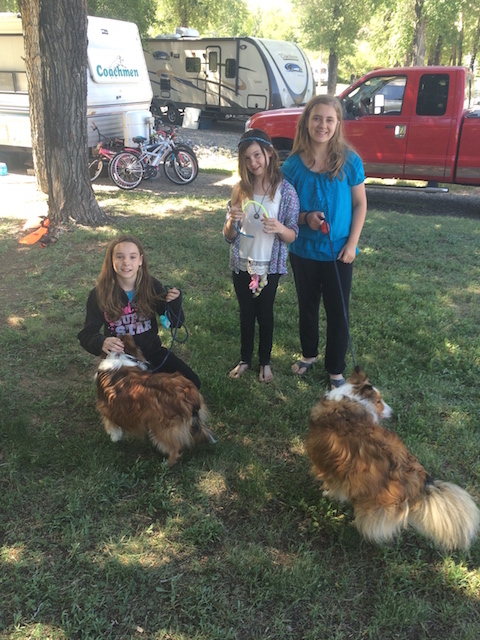 The girls also worked at the KOA for the summer by helping in the office. Mrs. Barb (the owner) let the girls help her organize the shop, pick which candy would sell the best and price merchandise. 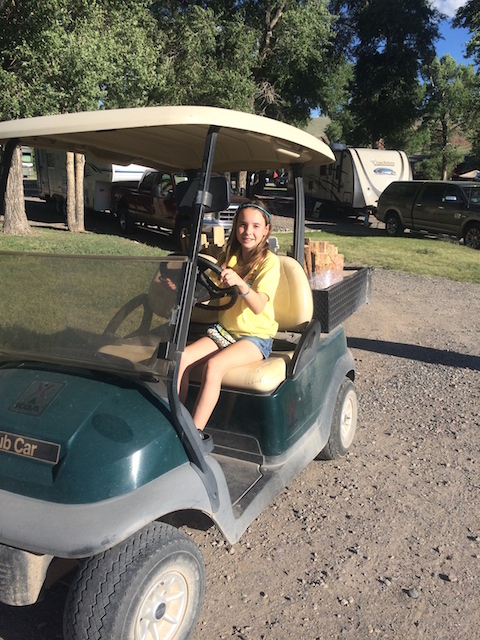 They offered to help with the ice-cream social and Munchy got to drive the golf cart around the campsite and show campers to their site. The girls got paid with lots of ice-cream, Gatorade, and sometimes a free stuff toy or two. They were also given fun yellow shirts to wear (which were happily named “Banana Shirts”). They loved their banana jobs the most because they could check out al the kids that came to visit and see if they wanted to play. There favorite job was taking care of dogs and walking them why visitors went to Yellowstone and the Grand Teton for the day. The girls actually designed dog walking cards to hand out at the KOA. They made $20 a day walking dogs and for fun I think the girls walked them every hour. The best way to find out what in your local area is still the newspaper but most the time you can research on the internet. I like asking local residents and finding a local paper or here in Dubois they flyer that is printed once a week in the “Poop Scoop”. We went and talked to the director of the boys and girls club and found out that they can come every day Monday – Friday to hang out with the local kids for FREE. Since the girls are 6th & 7th grade, Mrs. Jeda let the girls work at the Rodeo where they received lots of compliments how their customer service. 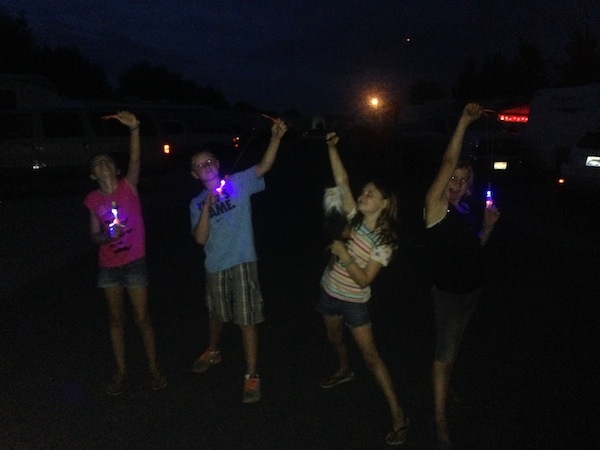 This entry was posted in Fulltime Tips and Tricks, Math, Neat ideas, summer activities, Unschooling and tagged boys and girls club, Business, kids make money, KOA, make money, rock climbing, rodeo, snack shack, summer job, white water rafting, Wyoming by Chrissie. Bookmark the permalink. I can totally see him working there!!!! I bet he works hard too! !